This was my second Startup Weekend. My team won! I was CEO and co-founder, partnered with two good friends (my co-founders) who were CTO and CDO. We created an app called Nikomu which was about connecting people through cooking together. For many many years I’ve been interested in how people connect through technology and this was a fun weekend of sprinting to explore new ways to do this. It’s incredibly easy get sidetracked on insignificant issues because there are so many issues and what is significant is often unclear. However, there was an initial vision that brought the team together. I was clear and consistent with this. When we could focus on accomplishing the initial vision –in its purest form– we could clear most of the clutter. That’s steering the ship through the storm and staying on the path. Brainstorming sessions lead to so many great ideas. As a moderator it’s important to balance all creative input with what must be accomplished. There were times for all idea to flow and times for being picky. Our ship date was Sunday so I developed the phrase “that’s for Monday.” This quickly became a phrase said amongst team members. It allowed us to acknowledge and even prioritize next steps while focusing on what needed to be done now, with this version. This is very different than “no” which can often shutdown participation. All too often in teams people want to be part of every thing and every decision. I am a huge advocate for participation and there are times when we each individually must trust each other to do what we are good at. As the team manager, I helped facilitate and guide but I trusted my teammates to do what they are good at – and empowered them to trust themselves. This allowed all of us to be more effective. For example, I could help make the over all user experience vision clear but I was not the designer of the interface. We would get mixed feedback sometimes. This would make us question if what we were doing was right. The value of a clear vision what that we could trust it and move forward. But we could adapt and build in ways to test the feedback. The most important thing is that the product matters less than the need it is filling. We were quick to adapt the product but we trusted and stayed with our vision. In many ways during the project I was able to act as the glue that held the team together. That was an exciting and fulfilling role for me as I helped the team execute and turn an idea into reality – in one weekend. I am very proud of every member of the team. We all know food brings people together – we use that to build community. 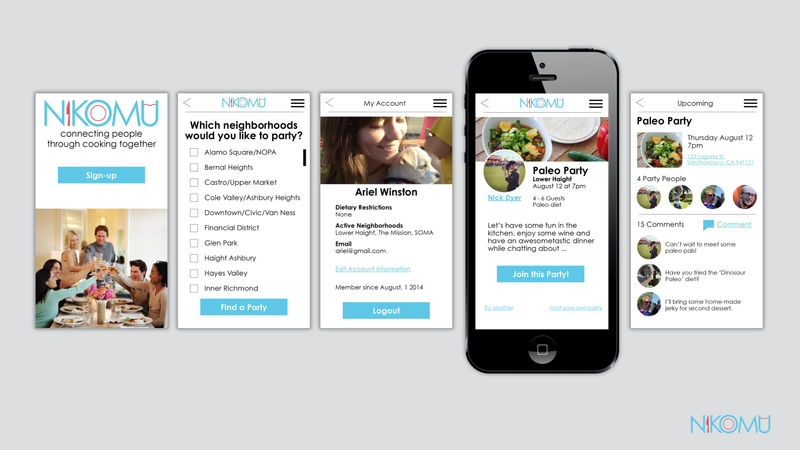 Nikomu is an app about connecting people through cooking together. Nikomu automates the setup of a dinner party by managing people, recipes, money, and food so you can just cook with people and enjoy. Our focus is on a shared collaborative experience, not being served like at a restaurant, so you can connect and build community with the people in your city. We charge a flat rate, focus on the young urban population, and have built in security features so you can feel comfortable using the app. Below is a link to the slides.